The great artist Claude Monet in 1886 painted the famous painting “The Lady with an Umbrella”, or rather two pictures: “The Lady with an Umbrella looking to the right” and “The Lady with an Umbrella looking to the left.” The canvases are very similar, since the model was the same woman Susanna Goshede, who later became the adopted daughter of the great master, he married her mother. In 1875, Monet painted the first painting “Lady with an Umbrella”, for which his first wife posed. Then, in the continuation of the plot, after a long and indecisive 10 years, he nevertheless decided and supplemented the cycle with two new works. Monet is really a great master of the pen, through colors he was able to convey the image, mood and even the state of mind of the depicted heroine. It is difficult, and at times, almost impossible. Just see how the blue color is depicted on the canvases. This is the sky, the general background, the details of clothing, an umbrella, everything has shades of this range, only they are depicted in different ways. The blue palette is blurred over white, it turns out, as it were, a tangle of color that can and often happens in real life. 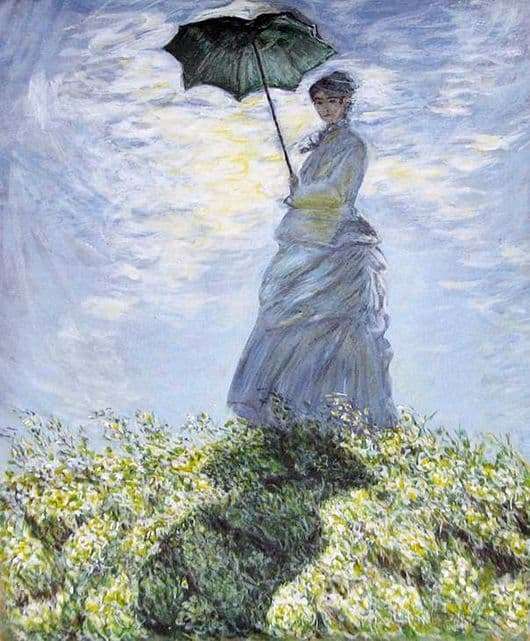 The sensation of movement is seen in all the main actors: the lady, the clouds, the umbrella, even if it belongs to inanimate nature, but nevertheless incredibly colorfully fits into the image. The lady’s face is foggy and mysterious, as the master wanted to convey. Not everything is so calm and smooth in her heart, as it seems at first glance at the plot. It is worth thinking about the image, manner of writing and the general background of the work, as completely opposite facts come to mind. This was required to prove, the master achieved what he wanted. With energetic strokes, the artist adds life and movement to the whole plot and to the written image of a lady with an umbrella. After seeing these amazing works, you can understand the artist the way he wanted it himself and tried to convey to the world.